Five teenage friends living on one street all dream of a sinister man with a disfigured face, a frightening voice and a gardener’s glove with knives for fingers. One by one, he terrorizes them within their dreams—where the rules are his and the only way out is to wake up. But when one among them dies, they soon realize that what happens in their dreams happens for real and the only way to stay alive is to stay awake. Buried in their past is a debt that has just come due. 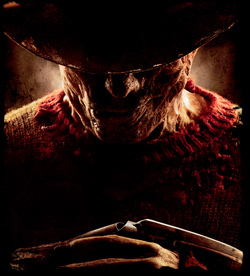 To save themselves, they must plunge into the mind of the most twisted nightmare of all: Freddy Krueger. Jackie Earle Haley (Little Children, Dark Shadows) plays the legendary evildoer in this contemporary re-imagining of the seminal horror classic. US: Welcome to Your New Nightmare. US: He Knows Where You Sleep. Home Video: Never Sleep Again.